The unofficial crest for the M.R.E.S. is shown below. In Appendix F of Missing Believed Killed Ref 6.2 the following account is given of the M.R.E.S. Crest. “The armed forces have always maintained a strong sense of humor. This has been the natural way to cope with a life full of hardships and sudden, violent death. Usually the humor is dark and fatalistic. This was perhaps even more the case with M.R.E.S.. This is certainly seen in the unofficial unit crest. 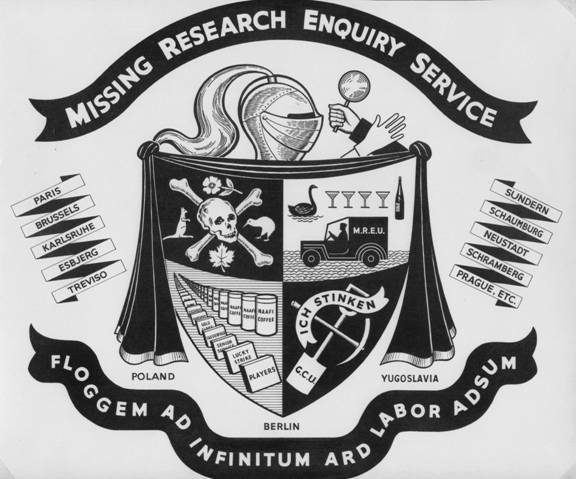 Some parts of the crest are self–explanatory; the black mourning cloth draped over the top, the heraldic helmet of the cavalry of the clouds next to the detective’s rubber glove and magnifying glass, and; the mock Latin motto. On the shield itself, the top left refers to both the gruesome nature of the work, plus the multi–national character of the service, with British, Australian, New Zealand and Canadian staff working together. Top right is slightly more obscure, and obliquely referenced members of the Occupation Forces using official transport (which was supposed to be strictly controlled) for expeditions "that would not stand up to official scrutiny" as to work related purpose ...…the haphazard movement of swans on a lake was to "characters" swarming around (the country) ....for example to re–connect with either a captor or a helper….. This same panel illustrates a service vehicle heading off almost certainly to an event where the wine would flow….. The final segment in the bottom right illustrates the close co–operation enjoyed with the Army Graves Concentration Units, and the somewhat unpleasant tasks they performed.